Two weeks ago I was back in Chicago and there was only one root beer that was on my mind. The root beer was one I’d tried to get before, I’d gone to the restaurant and ordered it. They said they didn’t have it but another tap room might. So, just to be sure I called the tap root and they confirmed they had it. But, when I showed up, the bar tender said they didn’t and sorry, next time I should ask to speak to the bar tender. 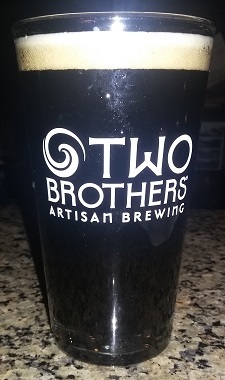 This, of course, did not leave me feeling happy about the Two Brothers Brewery. They said they were out because their brewing equipment for the root beer was under repairs. Also that the root beer is actually brewed over a period of 21 days, yet there’s no alcohol so I think that means they take all of the ingredients minus the sugars and start brewing and don’t add yeast or something. However it works that’s what they say they do and they make a cinnamon root beer which made me hope it was like the old Myers Avenue Red. Anyways, when I landed I gave them a call to confirm that they did have their root beer, and then I drove down and ordered some. The Body is smooth and sweet and largely dominated by a strong and spicy cinnamon flavor. There’s a solid sassafras core beneath it all as well but the cinnamon steals the show. It’s very unique. The Bite is nice and spicy and hot, giving a true cinnamon burn if you drink it too fast. The Head is medium height and is sufficiently foamy to last awhile. The Aftertaste is a sweet, slightly burning cinnamon. Yum! It’s really good, though I wish it had some creamy vanilla to compliment that cinnamon. Nevertheless, it’s still a solid, yummy brew that performs well in every category. I sat on the fence quite a bit with this one, it’s right on the line between a 3.5 and a 4. Maybe I should go down to 3.5 because of the troubles of getting it, but maybe it should get bonus points because of that unique cinnamon flavor. I’ve been in this position before and I’ll need to take the same decision. If there’s any doubt, no Seal, because a Seal of Approval brew should be overwhelmingly good. Still, it’s uniqueness merit’s a visit if you’re ever in the Chicago area. Their food is yummy too. 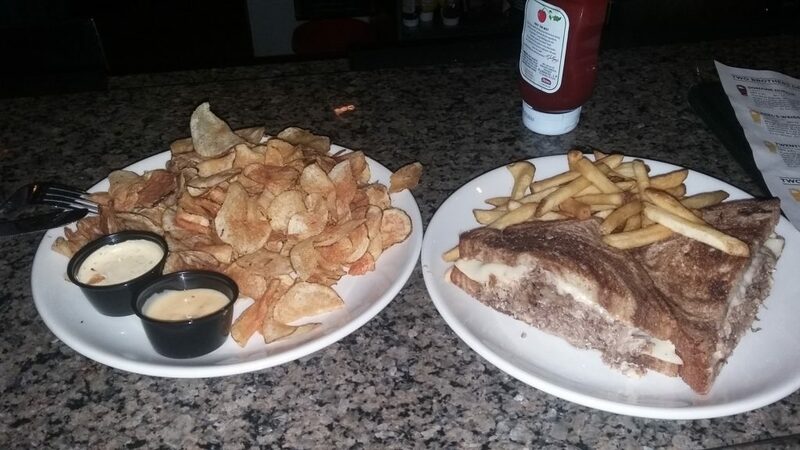 My meal of a reuben and fresh cut potato chips. It was so good.